We have been in wedding planning mode since November. Obviously, one of the biggest questions is FOOD! What are you going to serve to 300 people? Two years ago, we looked into having our other daughter’s wedding catered, but they wanted WAY too much $ for nothing. I decided to do all the food myself. It was quite the undertaking, but it worked out beautifully and I’m glad we did it. In a large stock pot, bring enough water to cover the green beans to a boil. Salt the water. Add the green beans and simmer for 4-5 minutes just until they are becoming tender yet still crunchy, but not cooked through. Drain the beans, rinse with cold water to stop the cooking, and set aside. Meanwhile, saute the bacon in a large saute pan. It’s really hard to tell from that picture, but it’s not super crispy. Measure the brown sugar, mustard, garlic, and pepper flakes, and set aside. 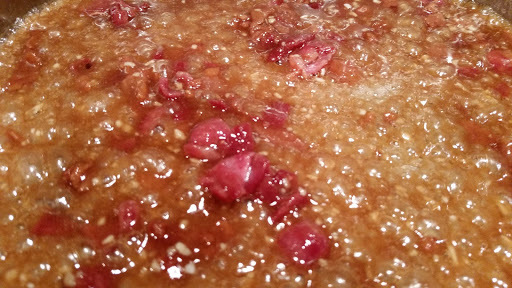 When the bacon is cooked, add the brown sugar mixture stirring until it is thoroughly combined and the sugar is melted. You really need “Smell-o-Vision” for this!! Your entire home will smell amazing! Can someone invent smell-o-vision, please? Add the green beans, salt & pepper to taste, and cook for 3-4 minutes until everything is thoroughly combined and heated through. This will not only be perfect to serve with smoked pork, but would also be great for a holiday meal or a dinner party you are hosting. It’s that good!